Margaret specialises in equity litigation, appearing regularly in the General Equity, Probate, Family Provision and Protective Lists of the Supreme Court, and NCAT (Guardianship Division). Margaret is a regular speaker at the College of Law, UNSW and LegalWise seminars. In 2017 she took up a role as a lecturer in the College of Law Applied Masters course. Prior to coming to the bar, Margaret qualified and worked as a registered nurse in a variety of roles before commencing the Diploma in Law administered by the Legal Practitioners Admission Board Diploma in Law. 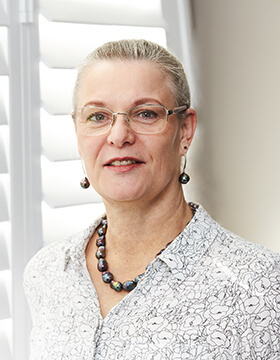 Margaret was then employed at the NSW Trustee & Guardian (formerly Public Trustee) where she specialised in equity litigation involving deceased estates, with a focus on matters involving testamentary capacity and claims for family provision, as well as probate and trust matters. Margaret was most recently recognised in Doyles Guide 2018 NSW as a Leading Junior Counsel in Wills and Estates.